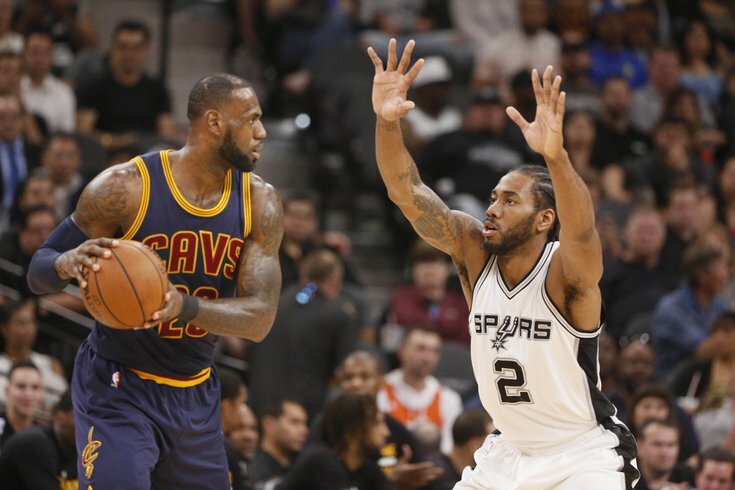 Could Kawhi Leonard and LeBron James meet up in L.A. to start the NBA's next super team? The NBA Draft is finally just around the corner, kicking off Thursday night when the Suns likely take DeAndre Ayton. What happens after that is anyone's guess. One thing is known — there will be trades. 2018 NBA Mock Draft: Could Luka Doncic really slide to fourth overall? We'll leave mocking the draft and looking ahead to July 1 free agency to other posts. Here is a brief overview of the potential blockbusters that could be made leading up to, during or immediately after the NBA draft. Kawhi to Lakers a sure thing? The Spurs still hold all the cards in the Kawhi sweepstakes (technically at least), with several rumors circulating that the team may, in fact, still be holding out hope that they might be able to retain their star forward next season. If not, he could be shipped off and draft night may be the venue. Will the Spurs actually be willing to trade Leonard somewhere in the west, like Los Angeles (his preferred destination) who they'll face multiple times per season? Woj also reported late Tuesday night that Leonard intends to sign with the Lakers after his contract is up in 2019 — making them the favorites as of right now (in a very fluid situation that has the Sixers and Celtics also on the case). The Spurs, despite the public knowledge of Leonard's intention to be moved are trying to maintain at least a little leverage in negotiations. Piggy-backing on the previous rumor, a Leonard to L.A. trade (or signing in 2019) could trigger the emergence of a bonafide super team on the Lakers, looking to accumulate talent and power to challenge the Golden State Warriors. According to USA Today's Sam Amick, Leonard and Spurs head coach Greg Popovich met today (a meeting scheduled weeks prior) to discuss his future with the team. In the same article, Amick contemplates the potential chain reaction if Leonard indeed does go to Los Angeles. "If Leonard found his way to Laker Land, where he would likely make it clear that he’d re-sign as a free agent in the summer of 2019, it is widely believed that it would significantly increase the Lakers' chances of landing LeBron James in free agency this summer. And Leonard, quite clearly, had decided it was time to move on after this season that was so full of mystery and tumult." And don't forget Paul George also wants to play in L.A.
Reports seem set on the Suns taking Ayton and the Kings going with Marvin Bagley III at No. 2 to lead off the NBA Draft. That makes the third pick — Atlanta's — a point of contention and speculation. The two teams picking fourth and fifth after the Hawks are the Grizzlies and the Mavericks. Each seems taken with the chance at drafting who many perceive as the top player in the draft, Euro star Luke Doncic. The Hawks have picks No. 3, 19 and 30 in the draft and could be one of the bigger wheelers and dealers Thursday, perhaps using their position and the high interest level from the teams behind them to make some kind of move. Or, maybe they'll just take Doncic. The Sixers seem likely to stand pat, at least as far as trading up goes (with Doncic, their prized possession probably off the board by No. 3 or 4). But two other teams have a lot of buzz with regard to trading to a higher slot. Take that tweet from the ESPN host, and other's like it how you wish, but the Clippers rumor makes sense. They have the 12th and 13th picks and could potentially package them to leapfrog a team in the second half of the top 10. As far as the Celtics go, they may be willing to part with a role player like Jaylen Brown or Terry Rozier — especially with firepower in the form of healthy Kyrie Irving and Gordon Hayward returning — but more likely may part with their own pick, 27 overall, and one of their two future firsts from the Kings and Grizzlies (both projected lottery teams at least next year).